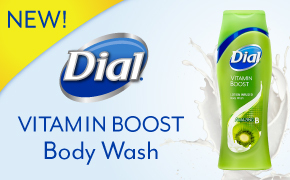 » Win a Free Bottle of Dial Vitamin Boost Body Wash! Home » Contest » Win a Free Bottle of Dial Vitamin Boost Body Wash! Win a Free Bottle of Dial Vitamin Boost Body Wash! Purex recently provided me with a bottle of their NEW Dial Vitamin Boost Body Wash to try out and coupons to give away. Dial Vitamin Boost Body Wash is deliciously scented and it’s lotion-infused to add extra moisturizers to your skin….perfect for the winter months! Want to try it for free? Enter to win a coupon for a FREE bottle of Dial Body Wash! Complete the entry form HERE by 2/28 to be entered to win. Check out more about Dial Body Wash here and print a $1 off coupon.